How Much Should You Spend On A Bottle of Wine? How Much To Spend On A Bottle of Wine? How much should you spend on a bottle of wine? Spending a lot of money on a wine doesn’t mean it is a good wine. I’ve had some pretty mediocre bottles that were $40 or more and I’ve had some really good ones that were less than $10. Price doesn’t equal quality although you are more likely to get a good bottle if you spend more. Unfortunately, the answer is never as simple as we would like but if you adhere to the couple of points below, you stand a good chance to get the most out of your wine and that is critical before even asking how much to spend on a bottle of wine. Why spend $50 on a bottle if you are going to turn it into a $20 bottle by serving it incorrectly? 1) Serve your wine correctly to get the most out of it. Click here to visit our pages on storing and serving wine correctly. Even good bottles of wine can be ruined by poor serving practices. 2) Store your wine correctly or even a prized bottle might end up tasting like vinegar. If you have questions on how best to store wine, we’ve provided some guidelines. 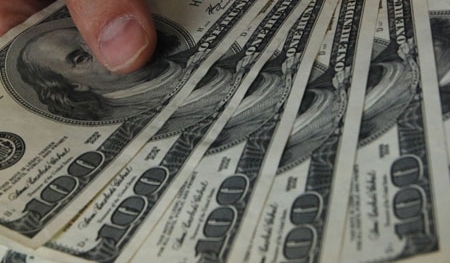 3) Never spend more than you can afford. Is this a critical ingredient for ensuring you have a good wine? No…of course not. Is it one for ensuring that you have enough money to eat for the next week or so you don’t stress yourself into a heart attack? Yep. Wine is great but basic common sense should dictate how much you spend. So assuming that you have not screwed up your wine by violating one of the points mentioned above, we’re still back to the same question. How much should you spend for a bottle of wine? First, answer this question. Are you buying wine to enjoy right away or are you buying it to lay down and store so that it improves with age? If you are buying wine to drink immediately, you’re in luck. These are usually cheaper than wines that are designed to improve with age. Just don’t expect them to get any better as they sit. Most of these types of wines are designed to be drunk when they are released. Aging them is pointless unless you are trying to make vinegar. If you are buying wines to sit down and age, you’ll probably have to spend more because wines designed to age usually involve more expensive grapes, longer storage in barrels and costlier bottling and corking processes. Buying younger wines that are designed to be aged is a great way to get great wine at a lesser cost. Someone has to pay for the storage of age worthy wines. If the winery does it, it will cost a lot more than if you do it yourself. If you store it, it’s kind of like “sweat equity” in a remodel process. If you are willing to invest your own time and space, you can save money. Well…in reality it’s probably more of a “Fool’s Gold Rule”. Call it what you will. We think it generally works pretty well. 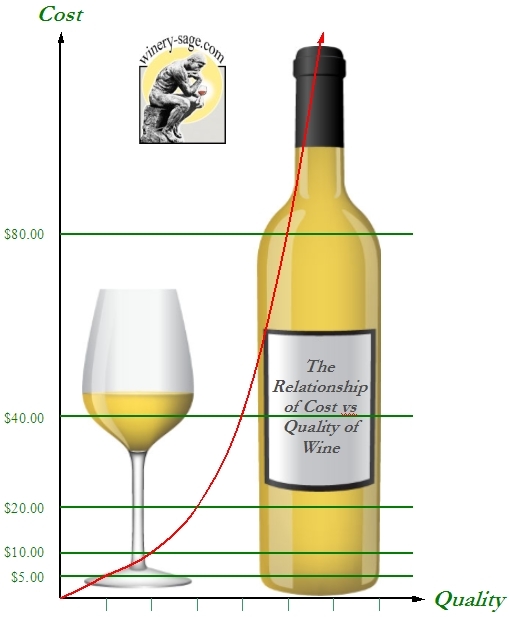 The price of the wine goes up exponentially while the quality only goes up linearly. Uh…say what? Ok for those of us who aren’t math nerds, let’s try it this way. The price of wine goes up a hell of a lot faster than the quality of it. Karen and I find that if we want a wine that is twice as good as another one, we need to spend twice as much. Ok..so far so good. That’s not rocket science but if we want a bottle that is even better, we now need to spend twice as much as that new number or four times as much as the original wine. Let’s take a drinkable Cabernet Sauvignon for example. If you’re happy with an $8 bottle but want to know how much to spend for one that is twice as good, you probably need to spend about $16. Looking for one that is twice as good as that $16 bottle? You probably now need to spend about $32. Hmmm…you like that $32 bottle but are you looking for more in a bottle? It looks like there is a $64 expenditure in you future. If you are looking for wine about two steps up (whatever that may mean to you), you’ll need to spend about four times as much. Is this rule concrete? Of course not. Quality and taste are subjective but the general pattern holds. That’s the general rule for cost vs. quality. Check out part two of this post for tips on how to find good wines and fair prices. , I could not agree more with your article. It kills me to watch people who know nothing about wine think that by spending more they will get me, especially on the wine list at restaurants. I would agree that someone with some basic knowledge of wine can spend more and get more but for the novice wine shopper it can truly be a crap shoot at best.